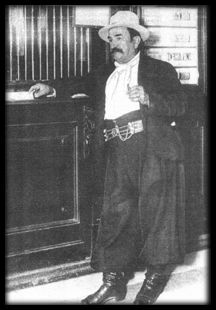 arlos Domingo Nasca, the Gaucho Relámpago (Lightning), was a pioneer for the criollo record. His recordings, labeled ERA, are worthwhile documents, mostly unique, of the early stage of tango. Artists like Francisco Canaro, Roberto Firpo, Juan Maglio and José Betinotti recorded their creations on those discs, made in the acoustical system, that today are the concern of all the serious collectors of tango and criolla music. Unfortunately, there is almost no document about the life of this lovable forerunner of the Argentine recording industry. Only the collectors, with love and devotion, have contributed data and old recordings that today allow us to know Don Carlos Domingo Nasca, the one who contributed so much for our culture. Now, 90 years later, to put a 78 RPM ERA disc on a turntable is like opening a chest with a treasure inside: the glorious bars of the Guardia Vieja, when the Rondalla del Gaucho Relámpago played “El caburé” or “Una noche de garufa” come to life. In this site you will find two excellent articles: Carlos D. Nasca, El Gaucho Relámpago, by Bruno Cespi, a detailed chronicle of the life of our dear character, and Germany, war, record… tango by Héctor Lorenzo Lucci. Also a release by maestro Lucci, the book El tango en la sociedad porteña 1880-1920, written by Hugo Lamas and Enrique Binda, which partly details the titles published by the ERA label. Lastly, Francisco Canaro, in his book Mis bodas de oro con el tango, tells us about his encounter with Nasca in order to record on ERA discs. Here’s an article and some pictures that will help us to know even more about this beloved character whose vision has gone beyond the passing of years. The Gaucho Relámpago... Who does not know him? Who, when seeing him walking along the streets of town, does not smile as if tickled by his elegant outfit, so thrilling for us and so dear at the same time? Because the Gaucho Relámpago is the living portrait of our grand grandfathers. His big bombacha, elegant shirt and luxurious waistcoat fastened with silver coins, his traditional necktie, his belt wider and more ornamented than a boxing world champion's, his light-color wide-brimmed hat, well fit on his wide forehead... Furthermore his heavy steps with a beat like a clock pendulum swinging from left to right, his shouted talking, so frank and deep, so nice and pleasant complete our conviction of meeting a true gaucho. We know that with this little chronicle we do not present the Gaucho, but a special circumstance made us speak with him and we think that never is superfluous to remember the old radio fans in our pages. 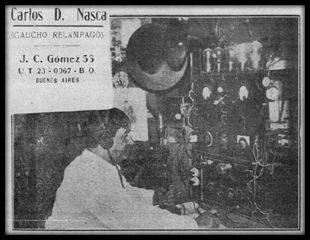 Yes, dear radio fan, the Gaucho Relámpago is a radio operator and from long since, indeed. In 1923, back in the beginnings of radio in our country, he fully devoted to it but not in its experimental facet. With a small transmitter fed by a generator, one of the first applied to these devices, he started his transmissions. He never cared about covering long distances: he was satisfied talking for the few operators, that like him, enjoyed having fun for a while. Later when many of his friends and others adopted the generator, he himself, with that spirit of contradiction usual in him, adopted the electrolytic vessels. He uses a Hartley transmitter and a Perry or Perro (dog) receiver as he calls it. —«God bless you», were the first words we heard from the Gaucho who without asking for permission, certain of that we all would greet him with pleasure, comes into the editor’s office looking for the boss. We shake hands with him. With his gaucho-style frankness he strongly shakes hands as if wishing to show all the nobleness of a simple soul. —«I’ve come to ask you please to correct some addresses of colleagues who have to appear on Guía Radio. My friends asked me to». He later goes on : «I felt like meeting the "owners" of the oldest and mostly read magazine, of the well-known Revista Telegráfica, more popular when more criticized on radio by those aching guys who you rightly criticize». When we asked him some information for this note, he smiled and expressed the satisfaction it made on him: «My station AK1 was best known as the Gaucho Relámpago's», he told us, «and I enjoy now thinking of what my friends would say when they see me in a photograph with my horse, especially in this magazine». —Do you love your devices much? We asked him wishing to wake up his entertaining talk. —«Yes... very much», he answers us. «But I'm sorry to say that... I love my colt more. First him, later comes... radio. If my horse knew how to speak or wheezed when I asked him to do so, a lot of times my dear radio-operator friends would have heard his complaints, his jealousy towards radio which steals him a part of my loving, but also his congratulating wheezes for being so lucky because his owner is... the Gaucho Relámpago... whose legal name is Carlos Nasca». After his mission was accomplished we shook hands as a farewell and shouting «good afternoon» he said goodbye. In the street his colt was waiting for him, a beautiful figure of a criollo horse, richly chapeao, with its upright ears and its eyes fixed on the stairs on which its owner was stepping down. Published in the Revista Telegráfica, December 1929.